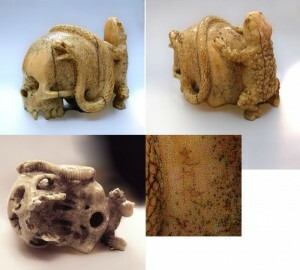 Netsuke Skull with Toad and Snake Bone. Signed and Attributed to: Gyokuzan the most famous of all the skull carvers. This skull netsuke / okimono is anatomically correct and is a rarely seen masterpiece of his work. Natural aging cracks as show.